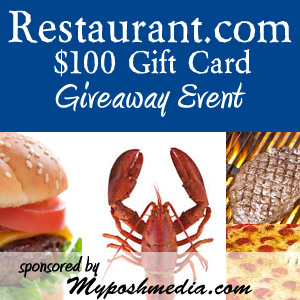 What would you do with a gift card to Restaurant .com? Disclosure/Disclaimer: This site or any other site associated with this event has in no way been compensated for the preceding information. This giveaway is valid where allowed by law, open to anyone who is able to shop via Restaurant.com and who is over 18 years of age. Two winners will be randomly selected notified via email, and will have until two days later to reply. If there is no reply another winner will be randomly selected. Please use your real email address if you are serious about winning this. Winners are posted on the MyPoshMedia site and, not on the entry widget itself, unless the winner wishes otherwise. Thanks so much!